The territorial collectivity of Saint-Pierre and Miquelon (French: Collectivité territoriale de Saint-Pierre-et-Miquelon) is an archipelago 15 miles off the southern shore of Canada's island of Newfoundland. They are a territory of the French Republic whose main islands consist of Saint-Pierre and Miquelon. The term 'Miquelon' is Basque for "Michael" and Saint Pierre is the Patron Saint of Fishermen. The archipelago is France's only remnant of its vast former territories of New France. Originally settled in the seventeenth century due to the attraction of their abundant fishing waters, the islands remain essentially a land of fishing villages and have forged their identity from the sea. Recent prohibitions on fishing in the Grand Banks due to overfishing have affected the economy and the islanders' way of life. However, the ocean is believed to be critical for the future of humanity, with the ability to supply food, nutrients, and medical resources. To this end, it is necessary to assistant in the replenishment of the environment surrounding Saint-Pierre and Miquelin. The territory of Saint-Pierre and Miquelon consists of a number of islands and the surrounding fishing areas in the North Atlantic Ocean, off the southern coast of Newfoundland, Canada in upper North America. The two major islands are Saint-Pierre and Miquelon/Langlade. They're surrounded by eight smaller islands which include to the southeast of St. Pierre: Grand Colombier, Petit Colombier, Île aux Marins (formally known as Île aux Chiens), Île aux Pigeons and Île aux Vainqueurs. While the total area of the islands is only 93 square miles (about the size of Brooklyn in New York City), they have a coastline which is over 75 miles long long. The island of Miquelon is roughly 16 miles from the coast of Newfoundland at their closest points. However, there is a small island with a lighthouse belonging to Newfoundland called Green Island that is between Langlade and St. Pierre and Newfoundland, about 6 miles from Langlade and St. Pierre. Miquelon and Saint-Pierre are separated by a 4 mile strait with very fierce currents. Fishermen call this section of ocean "The Mouth of Hell." The waters around these islands are very treacherous; there have been over 600 shipwrecks along the coasts of the islands. The term 'Miquelon' is Basque for "Michael." The island name 'Langlade' is a corruption of 'l'île à l'Anglais' (which is translated as Englishman's Island). Saint Pierre is the Patron Saint of Fishermen (along with Saint Andrew, St. Anthony of Padua, St. Benno of Meissen, St. Nicholas of Myra, and St. Zeno of Verona. 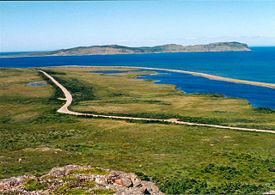 The island of Miquelon was formed by the joining of three islands by sand dunes and Quaternary deposits. These islands are Le Cap, Miquelon (Grande Miquelon), and Langlade Island (or Petite Miquelon). Miquelon and Langlade were separate until a large sandbar joined them in the eighteenth century. Miquelon has a lagoon called Grand Barachois, where seals and other wildlife can be found. Miquelon has a rocky cape, about 1 mile (1.6 km) wide, that extends 4 miles to the northeast. The southern area of the island is filled with rugged, barren hills that rise to Morne de la Grande Montagne, the highest point in the archipelago at 787 feet (240 m). Between the southern hills and the northern cape is an area of small lakes contained in peat bogs and marshes. The uninhabited Langlade is an ancient peneplain drained by numerous short rivers. The coast consists of rugged cliffs, except for the northern coast, which is joined to Miquelon by the Isthmus of Langlade. Saint-Pierre lies about 3 miles southeast of Langlade across the La Baie channel. It is a land of rugged hills in its northwest and a rocky lowland in its southeast section. Like Miquelon, peat bogs and small lakes and ponds are common. Its coast is varied, with cliffs to the north and irregular capes and points to the south. The summer climate is mild, though very damp and windy. The winters are harsh and long. Mean monthly temperatures range from 14° F (-10° C) in the winter months to 68° F (20° C) in the summer. The spring and early summer are foggy and cool. Late summer and early fall are sunny. The average annual precipitation is approximately 59 inches. Trilobite fossils have been found on Langlade. Seabirds are the most commonly seen animal. There is evidence of prehistoric inhabitation on the islands, most likely Beothuk. The European settlements on the islands are some of the oldest in the Americas, dating from at least the early sixteenth century. At first the Basque fishermen visited the islands only seasonally during the fishing season, but by the mid seventeenth century there were permanent French residents on the islands. The early settlement of the islands, which were prized by Europeans for their rich fishing grounds, was characterized by periods of conflict between the French and English. At the end of the seventeenth and into the early eighteenth century, British attacks on the islands caused the French settlers to abandon them, allowing Great Britain to take possession from 1713 to 1763. The French took the islands back in 1763 under the Treaty of Paris (which ceded all of New France to Britain except for Saint-Pierre and Miquelon) and settlers returned to live peacefully for 15 years. French support of the American Revolution led to a British attack on the islands and the deportation of the French settlers. Possession of Miquelon and St. Pierre passed back and forth between France and Great Britain for the next 38 years, as the islands suffered attacks by both countries, voluntary or forced removal of the island's residents, and upheaval associated with the French Revolution. France finally re-took the islands following Napoleon's second abdication in 1815, and there followed 70 years of prosperity for the French fishing industry and residents on Saint-Pierre and Miquelon. However, political and economic changes led to a slow decline of the fishing industry after the late nineteenth century. There was a short 13-year economic boom on the island associated with the period of Prohibition in the United States, when Saint-Pierre and Miquelon were prominent bases for alcoholic beverage smuggling. This boom ended with the end of prohibition in 1933, and the economy sank into depression. During the Second World War, the governor, Gilbert de Bournat, was loyal to the Vichy regime; he had to negotiate financial arrangements with United States authorities to obtain loans guaranteed by the French treasury. At the same time, Canada was considering an invasion of Saint-Pierre and Miquelon. Several pretexts were put forward, notably radio broadcasts of Vichy propaganda. It was alleged that the radio was helping German U-Boats on the Grand Banks, though this was never proven. Canadian prime minister William Lyon Mackenzie King never authorized the implementation of the plans. Under orders from De Gaulle, Admiral Émile Muselier organized the liberation of St. Pierre and Miquelon, without the consent or knowledge of the Canadian and U.S. authorities. On December 24, 1941, a Free French flotilla led by the submarine cruiser Surcouf took control of the islands without resistance. De Gaulle had a referendum organized, which was favorable to him, and Saint-Pierre and Miquelon thus became one of the first French territories to join 'Free France'. The affair led to a durable distrust between De Gaulle and Roosevelt. At the end of the World War II in 1945, the islands resumed their place as a center for cod-fishing. Other nations joined the French fleet to fish in the waters around the islands. The economy was not as prosperous as it had been, and by the 1960s French government subsidies constituted half the budget of the islands. This led to the reputation of the island residents as being "the world's most expensive Frenchmen." In the late 1950s, De Gaulle offered all French colonies political and financial independence. Saint-Pierre and Miquelon chose to remain part of France. A political leadership crisis in Saint-Pierre and Miquelon erupted in 1965. France sent in an armed force of 'gardes mobiles'. In response, the residents of Saint-Pierre and Miquelon mounted a three-day general strike in protest of this interference in local affairs. The islands became a full département d'outre mer of France in 1976. This status was modified in 1985 and the islands became a territory with special status, a collective territory. 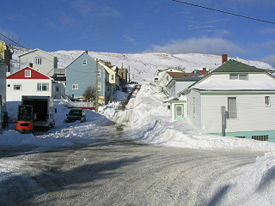 After the constitutional reform of 2003, it became a collectivité d'outre-mer, while keeping its particular name of collectivité territoriale de Saint-Pierre-et-Miquelon. Canada attempted to reduce the cod-fishing around Newfoundland in the 1970s and 1980s out of fear of seriously damaging the fish population. The French responded with the "Codfish Crusade" and fished in areas that were forbidden. The Canadian government inspected French fishing trawlers and jailed fishermen. In 1994, France and Canada mutually agreed to reduce the fishing industry in Saint-Pierre and Miquelon. To the consternation of law enforcement officials, there continues to be smuggling of alcohol and tobacco from Saint-Pierre and Miquelon to Newfoundland. This illegal trade has a long history and tradition, and is partly driven by a depressed local economy. Today, Saint-Pierre and Miquelon represent the sole remaining vestige of France's once vast North American possessions. They have always been most important as a fishing center, being in easy traveling distance of the Grand Banks of Newfoundland and Labrador, some of the world's richest fishing grounds. However, they are slowly diversifying their economy into tourism and other activities, with the assistance of the French government. As a result of an agreement between the European Union and France, the Euro became the legal currency of the French overseas territories of French Guiana, Réunion, Saint-Pierre and Miquelon, Guadeloupe, Martinique, and Mayotte in 2002. The politics of Saint-Pierre and Miquelon take place within a framework of a parliamentary representative democratic, French overseas collectivity, whereby the President of the Territorial Council is the head of government, and of a pluriform multi-party system. Executive power is exercised by the government. France is responsible for the defense of the islands. Saint-Pierre and Miquelon sends one deputy member of Parliament to the French National Assembly and one senator to the French Senate. Saint-Pierre and Miquelon is administratively divided into two municipalities. They are: Miquelon-Langlade and Saint-Pierre. In 1992, a maritime boundary dispute with Canada over the delineation of the Exclusive Economic Zone belonging to France was settled by the International Court of Arbitration. In the decision, France kept the 12 nautical mile territorial sea surrounding the islands and was given an additional 12 nautical miles of contiguous zone as well as a 10.5 nautical mile wide corridor stretching 200 nautical miles towards the south. The total area in the award was only 18 percent of what France had requested. The boundary dispute had been a flash point for Franco-Canadian relations. New claims have since been made under United Nations Convention on the Law of the Sea (UNCLOS) by France over the continental shelf. Many efforts are being made, with the help of the French government, to diversify the local economy. Tourism, fish farming, crab fishing, and agriculture are being developed. Agricultural products include vegetables, poultry, cattle, sheep, and pigs. Major exports consist of fish and other fish product along with mollusks and crustaceans, fox and mink pelts. Exports are divided among the United States and Zambia both at a 30 percent rate, Ecuador at 20 percent rate and France at a rate of 10 percent. Major Imports of meat, clothing, fuel, electrical equipment, machinery and building materials are a sent into the country. Zambia sends in 62.3 percent, France sends in 21.7 percent and Canada sends in 13.2 percent, as of a 2002 census report. Until the 1990s, the islanders used French postage stamps, but they now issue their own. Between 1890 and 1965, the islanders used the Saint-Pierre and Miquelon franc, which was equal to the French franc until 1945, then to the CFA franc between 1945 and 1960, and then to the French new franc until 1965, when the French currency was established as the sole circulating currency. Since 2002, the islanders use the euro as does most of Europe, as many leading countries traded in their single currency for the larger continental currency. The population of Saint-Pierre and Miquelon at the 2006 local census was 6,125 inhabitants. Saint-Pierre was home to 5,509 of these people while the other 616 resided on Miquelon. The population did not increase in the twentieth century. Langlade has no year-round residents, since its sole inhabitant, Charles Lafitte, (widely known on the islands as "de Gaulle," who lived as a hermit on Langlade for many years with his dogs) died in July 2006. However, Langlade is a summer retreat for many of Saint-Pierre's residents, when its population swells to 1,000 inhabitants. French is the official language of the islands, while its customs and traditions are also French. Although French is spoken, the local accent and many of the words used in everyday language are similar to, and have roots in, Norman languages. French patriotism is strong on the islands, and the islanders are proud that some of the soil on the island is French, having been brought over in the ballasts of ships. Basque pride might be just as strong, given the strong historical ties of the islands to the Basque region of France. Every summer there is a Basque Festival, with demonstrations of harrijasotzaile (stone heaving) and haitzkolari (lumberjack skills). Street names are not commonly used on the islands, therefore, directions and locations are commonly given using nicknames and the names of nearby residents. Hockey is very popular. Several players from the islands have played on French teams and have participated on the French National hockey team in the Olympics. The islands have only 70 miles of highway plus an additional 28 miles of unpaved roads. Saint-Pierre and Miquelon is the only jurisdiction in North America to not have adopted standard 6 x 12 inches vehicle registration plates, but instead uses French-style plates. Its only major harbor is the Saint-Pierre harbor, which offers regular ferry service that is available for transportation between Saint-Pierre and the town of Fortune, Newfoundland. There are two airports; the Saint-Pierre Airport and the Miquelon Airport. Both airports are serviced by Air Saint-Pierre which connects Saint-Pierre with Miquelon and several Canadian cities. ↑ Central Intelligence Agency, Saint Pierre and Miquelon The World Factbook. Retrieved January 16, 2012. ↑ L'Outre-Mer, Présentation Saint-Pierre-et-Miquelon. Retrieved January 16, 2012. ↑ 3.0 3.1 Evaluation du PIB 2004 de Saint-Pierre-et-Miquelon - janvier 2007, page 24 Retrieved January 16, 2012. ↑ St. Pierre et Miquelon, Memorial University of Newfoundland. Retrieved November 15, 2007. ↑ Encyclopædia Britannica. 2007. Saint-Pierre and Miquelon Encyclopædia Britannica Online. Retrieved November 25, 2007. ↑ Saint-Pierre & Miquelon, Miquelon Consulting. Retrieved November 19, 2007. Anglin, Douglas George. 1966. The St. Pierre and Miquelon affaire of 1941 a study in diplomacy in the North Atlantic quadrangle. Toronto: University of Toronto Press. Municipal Government of St-Pierre (French) Official Site. CIA World Factbook – Saint-Pierre and Miquelon. History of the Atlantic Cable & Undersea Communications – The French Cable Station Museum at Orleans, Cape Cod, Massachusetts. Memorial University of Newfoundland – St. Pierre et Miquelon. Saint-Pierre & Miquelon – Tourism and travel information. Saint-Pierrais et Miquelonnais expatriés – Projet documentaire. 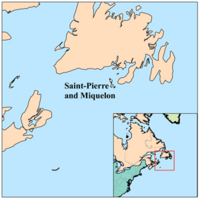 History of "Saint-Pierre and Miquelon"
This page was last modified on 4 August 2015, at 14:55.